Bill Brangiforte coming to the finish line in the race with gentle breezes. Today was a weird one. It started with sailors unable to make headway in the 2 knot southerly against the 3 knot current. Some skippers passed the same channel marker no fewer than 7 times as the wind blew them past it one way in puffs, then as the wind died, the current pulled them back past it the other way. Most skippers ended up being towed out to the race course so that racing could get started. The RC managed to get 1-1/2 races in before the light, fickle winds became the extremely heavy, fickle winds. Within a few seconds, wind speeds went from less than 10 mph to over 30. 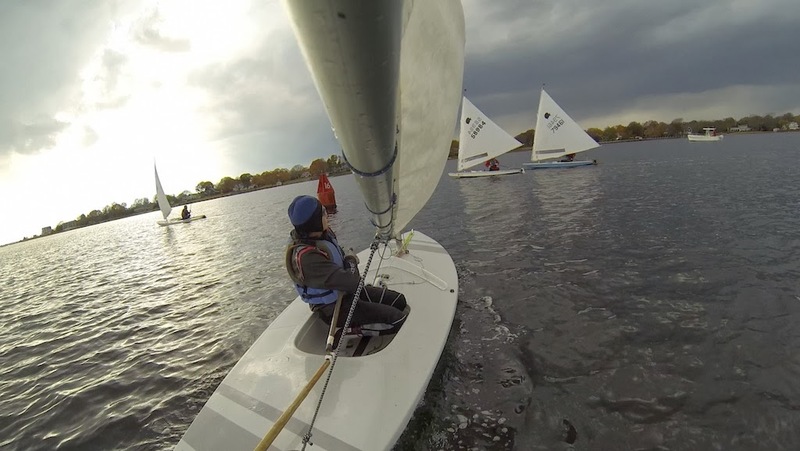 The B fleet got caught in the squall at the leeward mark. Mark Stoughton got around just before the squall hit, and he got on a plane and covered the entire upwind distance to the finish line in about 30 seconds. The rest of the B fleet was unable to round the mark at all until the worst of the squall had passed. The consensus among the fleet and the RC was that it would be too dangerous to continue racing, so the third race of the day was back to the dock. The wind had abated somewhat for the first half of that race, but then came back with a vengeance, blowing 20-25 and shifting 20-30 degrees, making the race a workout for everyone involved. The tide had changed too, so the current that was against them going out to the race course was against them again going back in. Sailors got stuck in irons and couldn't get out. Some kept getting pushed back downwind. Others were pushed into the docks that line the right side of the channel. A couple of sailors capsized, and a few had to be towed in. Out of the carnage that was racing today, Scott Greenbaum took 3 firsts in his first day of Frostbite racing this season. Bill Brangiforte (this week's BoatCam victim) took 2nd and Eric Woodman took 3rd. Mark Stoughton got 1st in the B fleet, followed by newcomer Steve Boyajian and Bernadette Levesque.